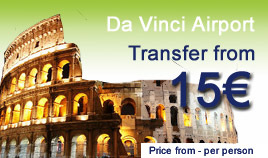 Rome is served by two airports : Leonardo da Vinci Fiumicino FCO airport - the main one and Ciampino airport. Please note that Ciampino airport is quite basic and no traveller should be lost when arriving at the airport - However we provided a basic map of it. Select the airport of your choice to see the terminal maps or to book an airport transfer.